Zubop, vibrant party band playing 100% original dance music. Combine sounds from South Africa to South America and from funk through reggae to klezmer and beyond. WORLDBEAT, UPBEAT AND GUTSY FOR DANCEAHOLICS EVERYWHERE! Zubop play original compositions which combine global dance rhythms and jazz improvisation. The band’s members have between them a wide-ranging experience of and affinity for many musical styles, including salsa, samba, South African township music, ska, funk, reggae, Northumbrian folk music, North African and Eastern musics. Whilst the term ‘Worldbeat Jazz’ has sometimes been a convenient and fairly accurate term to describe what they do, the members of the band are unanimous in their desire to allow an unrestricted range of influences to play a part in forming their music. All six members of Zubop are composers, providing great diversity of input into the repertoire. 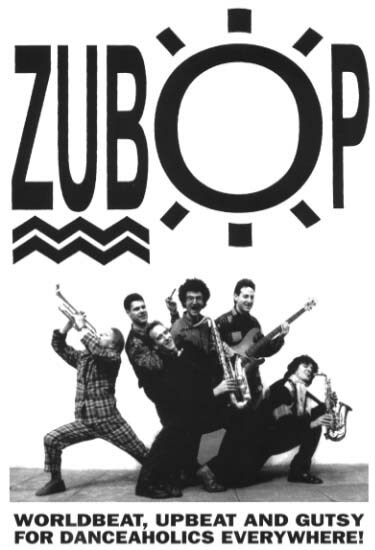 Zubop’s strength lies in the collective arrangement of all their pieces, forging these onto a coherent sound which is unmistakeably Zubop. The band has completed several tours in Germany and Switzerland, and performed in most parts of Britain. The frequency with which they receive return bookings testifies to their ability to delight in all sorts of venues. Festivals: WOMAD (Reading), Bodensee Festival (Germany), Soho Jazz Festival, Stockton Riverside Festival (Tees-side), Worldbeat Festival, Franz Club (Berlin), Lichfield Jazz, Blues and Real Ale Festival, Bridport Festival. Arts Centres: Hackney Empire, Royal Festival Hall Foyer (London), Waterman’s Arts Centre (Brentford), Exeter and Devon Arts Centre, Wyeside Arts Centre (Powys), GEMS (Singen, Germany), K9 (Konstanz, Germany), York Arts Centre, Brewery Arts Centre (Cirencester), Hope Centre (Bristol). Dance Clubs: Mambo Inn (Brixton), Kulturladen (Konstanz, Germany), Bass Clef (London), Vorderhaus Fabrik (Freiburg, Germany), JuJu Club (Sheffield). Jazz Clubs: Vortex (London), Blue Note (Hemel Hempstead), Sinkkasten, Jazzkeller (Frankfurt, Germany), Southampton Jazz Society. Universities: University of Essex, University of East Anglia, Goldsmith’s College, University of Keele, Camberwell School of Art, Farnham Art College, University of London Union, The Architectural Association, University of Darmstadt (Germany), Trinity College (Cambridge).